Last week a man got maced in the face for asking a fellow patron in a cinema to turn off their smartphone during the screening of a film. What is shocking is not that the attacker was a woman, or that it happened during a screening of an art-house film, or that the woman was escorted off the premises rather than arrested. No, the single most shocking thing is the defending silence from the cinema industry in the face of such an attack. Not only have no lessons be learned since the fatal shooting earlier this year over an argument over smartphone use in the cinema, but there appears to be no willingness to tackle this issue. 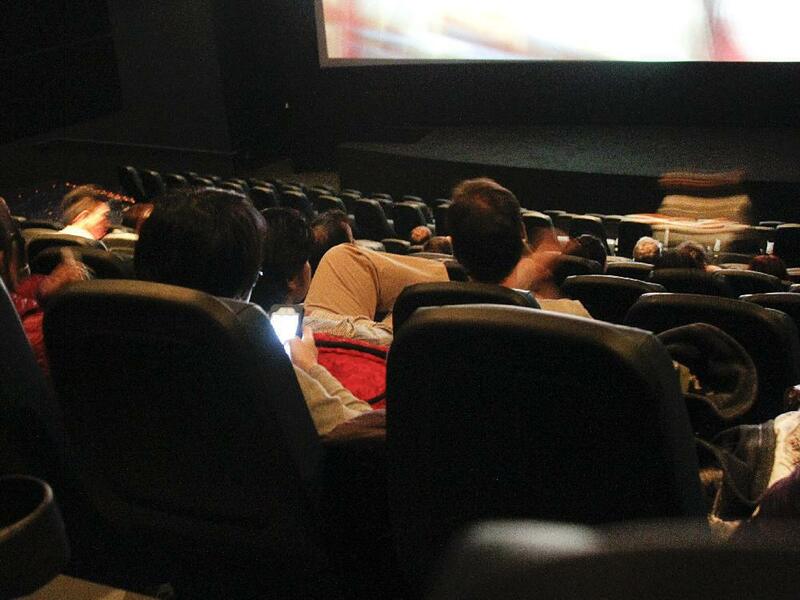 The use of smartphones in cinemas is killing the cinema-going experience more effectively than camcorder piracy. Let me repeat: smartphones use in cinemas is killing the cinema-going experience more effectively than camcorder piracy. If it is not tackled it will contribute to the further decline of cinema attendance. There is an urgent need for concerted industry action. Sadly, there appears to be a lack of leadership and willingness to challenge prevailing social norms. The attack itself took place in the heart of Hollywood, at a screening of a film considered an awards contender at an iconic cinema located just a block away from the Dolby Theatre (formerly the Kodak Theatre) where the Oscar statuettes will be handed out in a few short months. The man was at an American Film Institute screening of Mr. Turner when he asked a woman to stop using her cell phone, an eyewitness told Mashable. After asking several times, he tapped the woman on her shoulder. The woman had a violent reaction to the shoulder tapping, and stood up, turned on her phone’s flashlight app, screamed at the man and threatened to call the police. It boggles the mind that the alleged attacker would sit down to continue enjoying the film after she had temporarily blinded a fellow cinema goer. But more troubling is that the management in the cinema apparently did not see fit to call the police or escalate the matter, but simply escorted the woman off the premise. No word on whether she was refunded the cost of her ticket on her way out. Anyone who has been to a cinema this year will know that persistent smartphone use during a film has become the norm rather than the exception. The same week as the Hollywood attack there was a timely editorial about how “Little screens are killing the big-screen experience” by Bill Brownstein in the Montreal Gazette. At a recent multiplex screening, two women and a man sitting in the row in front of me seemed to have forgotten to turn off their smartphones when the main attraction began. Ever so politely — well, as polite as I can be — I bent forward toward their seats and asked if they would please turn off their devices. I wasn’t prepared for the response. Or maybe I was. This was not a one-off, as the author goes on to inform us. A few days later at a screening at another theatre, the young couple sitting in front of me actually waited until the film began to turn on their devices. I asked if they wouldn’t mind turning them off. Sad to say, he was right about the cellphone situation. Okay, maybe not half the people in the house. But enough to make for quite the light show in the theatre. And this is from supposedly polite Canadians! Still don’t believe me how bad the situation is? Take this article from Daily Dot called “How to fix the American movie theater” by Chris Osterndorf, also published coincidentally the same week as the mace attack. However, even if you’re content with the price of food and tickets, that still leaves the experience of watching the movie itself to contend with. And oftentimes, this is the most challenging part of all. Cell phones and smartphones have made it nearly impossible to get through a movie without some minor distraction. Sure, the theater tells people to turn them off, but that doesn’t automatically stop anyone. Because if it’s not a person answering their phone outright, it’s the glow of sporadic texting. And then there are the other non-technology related distractions, such as people who arrive late, people who bring their children to films they aren’t ready to see, and of course, people who talk the whole time. This has all been exacerbated in the past few years by incidents such as the time a man in Philadelphia shot someone for talking during a movie, or the screening at the Toronto International Film Festival where a blogger called 911 on a chatty audience member. Then there was the infamous Alamo Drafthouse voicemail, which was turned into a disclaimer warning patrons not to text or talk in the theater lest they be kicked out [see video above]. This in turn led to more discussion, especially on the part of critics, as to the proper way to respond to rude moviegoers. The social norm that it is somehow acceptable to stare at a bright smartphone screen while others try to focus on the big screen, coupled with the unwillingness of cinema staff to challenge such patrons, lies at the heart of the problem. Celluloid Junkie reached out to the two major cinema trade body groups, NATO in US and Canada as well as UNIC and CEA in Europe and UK, asking them what they were doing to communicate to their members about pro-actively dealing with patrons who refuse to switch of their smartphones during film screenings. Cell phone use is discouraged. We believe an important part of our customers’ experience the courtesy and consideration of their fellow moviegoers. Individual companies develop their own policies and practices as to how such incidents should be handled. One consideration in dealing with rude behavior is whether it is made worse by intervening. Each situation is different. The incidence in LA is of course very unfortunate and pretty unusual. In Europe, policies on smartphone use in theatres are handled individually by each exhibitor. As an international umbrella organisation UNIC monitors audience trends and informs its members of new developments if they occur in a certain territory. Our main focus, however, is political advocacy in the EU and in our member territories. We don’t advice our members how to deal with people texting in cinemas. As trade bodies NATO, UNIC, CEA and others cannot dictate policy to their members. Moreover, reading between the lines, the feedback they seem to have been getting is that members are unwilling to adopt the ‘Zero Tolerance’ policies that Alamo Draft House has in place. Asking a teenager on minimum wage who sells popcorn and checks tickets to challenge paying patrons and potentially getting into a fight is not something most cinema chains appear willing to do. Edelstein is right, though, it should be their job. Because if they don’t do it they could very well be out of a job, if enough people stop going to the cinema as a result. But they can only do it if they are empowered by their managers, all the way up to the CEO and HR (human resources). The biggest problem is that cinemas have not kept up with the times. At the risk of generalising, inconsiderate smartphone users tend to be younger while those objecting tend to be older patrons. Cinemas would prefer not to antagonise younger patrons, which is why asking someone to switch off their smartphone during “Dumb and Dumber To” is something of a lost cause. But when violent encounters take place during screenings of British period dramas, alarm bells should be going off at the corporate head quarters of Regal, AMC, Odeon, Vue and Kinepolis. Here is what we suggest could and should be done. There is currently a PSA (public service announcement) in my local cinema to switch off your phone, featuring the Penguins of Madagascar. A penguin coughs up a fire extinguisher, a chainsaw and assorted phones. People laugh, but it has zero impact on the likelihood of people switching off their phones. Cinemas love these PSAs because they don’t cost the exhibitor anything to make (Dreamworks Animation paid for it), they can be swapped out so people don’t get bored of them, plus it enables them to promote an upcoming film. But it does nothing to discourage smartphone use. Audience may laugh but they filter out the message. This is true for pretty much every single trailer PSA I have ever seen, like the one for “Chicken Little” above or the Minions one below. Cinemas need to make more hard hitting PSAs regarding smartphone use, including notifying them that they could be asked to leave the premises if they do not comply. This is not as cute and funny as Penguins or Minions, but it empowers those in the audience who draw attention to rude behaviour. The problem these days is not so much phones ringing, people talking on them, or even texting. The problem is extensive and extended use of Facebook, WeChat and WhatsApp or emails on smartphones with 5-inch or 6-inch screens that shine brightly. The message these days has to be, Do Not Use Your Smartphone During The Film, because other people find the light distracting. This will turn some heavy smartphone users off going to the cinema and may mean that they watch pirated copies at home. But we feel there is a greater majority of cinema patrons that will be grateful for not having their cinema experience ruined. Sending the popcorn seller in to deal with individuals or groups wedded to the use of their phones is nobody’s idea of fun. But just like airline staff are trained in how to talk to drunk and abusive airline passengers, so too cinema staff need to have the negotiating skills for politely discouraging smartphone (ab)use. More importantly, they need to know they have the backing of their manager to remove patrons from the premise if the abuse persists. Nobody is happy to be told to leave half-way through a film, so offer to reimburse their tickets if required. It is a small price to pay. Film and cinema authorities have a ‘zero tolerance’ policy when it comes to using electronic devices in the cinema – if they are used for recording the film. Witness the recent ban on ‘wearables’ like Google Glass in cinemas. Ironically, Google Glass is the device least intrusive and disruptive device for those around you in case you have to check your email and messages (apart from the voice commands), because the screen is invisible to anyone except the wearer. But the ban is designed to protect films, and the Hollywood studios that made them, not those who paid to watch those films. NATO, UNIC and CEA may not have the power to compel the members to take action, like they can with film theft. But they have a voice and a responsibility to not just act on the interests of cinemas but also on behalf of the cinema goers. Working together, they can help to establish an industry norm that disruptive smartphone use will not be tolerated. Only this can help shift the wider social norm about acceptable behaviour in cinemas. Cinemark has tried and failed to have the lawsuits dismissed. It may even end of losing them, which could cost Cinemark a lot of money, but also set an important precedent. The next time there is a violent incident in a cinema relating to smartphone use, it is not inconceivable that any future victim could claim that the cinema did not do enough to discourage such use, or intervene. Playing the “Penguins of Madagascar” PSA in court as Exhibit A in defence of cinemas will hold little water. Sadly we have not been proven wrong in the months since, though this latest incident was the most notable act of ‘smartphone rage’ to bookend the year. If we wait for social norms to catch up we risk losing a significant portion of the frequent cinema going population. From personal experience, things have gotten so bad that I now opt for cinema seats 1/3 away from the screen, rather than my preferred middle or 2/3s back, because that way I have fewer smartphone screens shining in my eyes. I tell people sitting next to me who do it – trying to be very polite about it despite being upset about it – that the light bothers me and could they please refrain from doing that. Several times those doing it have becoming angry and abusive. I also can’t do anything about those lighting up the cinema with their Samsungs and iPhone 6s several rows away. I still go to the cinema almost every week, but each time I now fear what will happen. I simply no longer feel that going to the cinema is an enjoyable and safe experience. If you feel the same or have your own experience to share, please leve a comment below or share this article.